For the New Zealand naturalist, see Henry Travers (naturalist). Travers John Heagerty (5 March 1874 – 18 October 1965), known by the stage name Henry Travers, was an English film and stage character actor. His most famous role was the guardian angel Clarence Odbody in the 1946 film classic It's a Wonderful Life. He also received an Academy Award nomination for his supporting role in Mrs. Miniver (1942). Travers specialized in portraying slightly bumbling but friendly and lovable old men. The Travers family lived in Prudhoe for a couple of years before moving from Woodburn, on the A68 road near Corsenside, Northumberland, in about 1866, to Tweedmouth, Berwick-upon-Tweed, in about 1876. Initially, he trained as an architect at Berwick, before taking to the stage under the name Henry Travers. Travers played character roles almost from the beginning of his acting career in 1894, often figures who were much older than himself. He made his Broadway debut in 1901, but returned to England. Travers again went to the United States in 1917 after a long and successful theatre career in his homeland. He played frequently from November 1917 until December 1938 on Broadway in over 30 plays. However, his last play on Broadway You Can't Take It with You was his most famous, where he acted in over 380 performances in two years. In the Oscar-winning movie You Can't Take It With You, Lionel Barrymore played the role which Travers had portrayed on Broadway. Like many other theatre actors, he made his first movie only with the advent of sound films. His first was Reunion in Vienna in 1933. In the same year, he played the father of Gloria Stuart in the horror classic The Invisible Man. He often portrayed doctors, judges, and fathers of the main figures in supporting roles. Travers specialized on portraying slightly wry and bumbling but friendly and lovable old men. He appeared with Greer Garson and Ronald Colman in Random Harvest (1942) and with Bing Crosby and Ingrid Bergman in The Bells of St. Mary's (1945). Alfred Hitchcock used Travers as a Comic relief in Shadow of a Doubt (1943), where he played a bank clerk with a passion for criminal magazines. The character actor also portrayed the Railway Station Master Mr. Ballard with a love for roses who finally wins the annual flower show in his village shortly before dying in a bombardment in Mrs. Miniver. He received an Academy Award-nomination as Best Supporting Actor for this appearance. 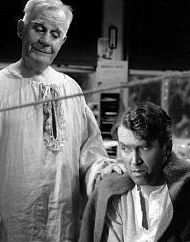 Travers's most famous role was as James Stewart's somewhat befuddled but kind-hearted guardian angel Clarence Odbody in Frank Capra's 1946 film It's a Wonderful Life. Traver's character saves Stewart's from committing suicide, and shows him how wonderful his life really is. Though the film was a financial flop, it later became a Christmas classic and one of the most beloved films in American cinema. However, despite his long life, Travers would never know that his performance as Clarence would become his most celebrated, as the film only became a Christmas television perennial in the 1970s and 1980s, long after the actor's death. Travers retired in 1949 after his supporting role in The Girl From Jones Beach. Overall, he acted in 52 films. His first wife was actress Amy Forrest-Rhodes (1881–1954). They were married until Amy's death in 1954. Travers married for a second time to Ann G. Murphy (1899–1983) who was a nurse. After several years in retirement, Travers died as a result of arteriosclerosis in 1965, at the age of 91. He is buried with his second wife in the Forest Lawn Memorial Park, Glendale. ^ Armstrong, Jeremy (27 December 2015). "Did you know one of the most famous Christmas angels was born in Prudhoe?". Retrieved 17 January 2017. Wikimedia Commons has media related to Henry Travers.